Product #15867 | SKU HDJ-1500-K | 0.0 (no ratings yet) Thanks for your rating! The black Pioneer HDJ-1500 Professional DJ Headphones deliver the precision audio quality and durability professional DJs depend on. The HDJ-1500's feature 50mm drivers with rare-earth magnets for high output levels. To keep DJs monitoring accurately in their noisy line of work, the HDJ-1500 headphones feature enhanced isolation from outside sounds. 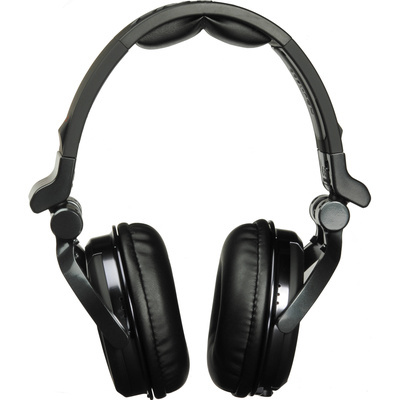 HDJ-1500 headphones are built for comfort and longevity with magnesium alloy joints at the earcups, allowing for swivel, rotation, and dependable single-ear monitoring. The cable itself is detachable and easily replaced in the rare event of a short or break. The headphones include a carrying pouch and a 1/4" adapter. Leatherlike polyurethane earpads are kind to ears during prolonged usage, while narrow earcups create excellent isolation from outside sound.